Assemblywoman Shirley Weber easily won re-election Tuesday night, but at downtown’s Golden Hall she was more focused on a fellow Democrat’s race. Hillary Clinton was winning California — plus her party’s nomination for president. “There are a lot of great things happening,” Weber said. “It’s unique in one’s lifetime to experience such groundbreaking changes. Eight years ago, seeing that we were going to possibly elect the first African-American president and nobody ever thought they would see that, and then to be in a position to also see the first woman to get the nomination of the Democratic party is an amazing experience. San Diego’s Election Central — where results were posted and candidates and sign-toting supporters paraded from broadcast interview to interview — was buzzing after Clinton defeated Bernie Sanders. 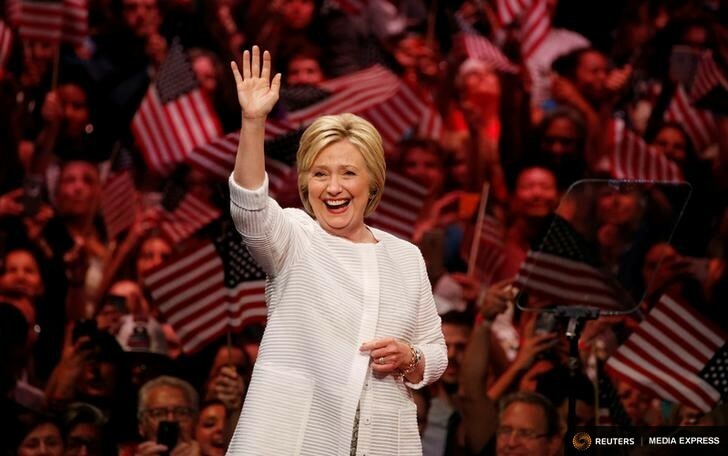 Having a woman win the nomination of a major party was a historic moment. Also momentous was the Democratic turnout which boosted the party’s candidates and causes lower on the ballot. For girls growing up today, she said, Hillary Clinton’s nomination — and possible election as president in November – will make a major difference. Someday, Weber ventured, there might even be two women on a presidential ticket, but she does not expect Hillary Clinton to nominate another woman as a running mate. Weber, who is African-American, said as a result of her success first as a member of the San Diego Unified School District board, and later as a member of the Assembly, other African-American women have stepped forward to run for office. 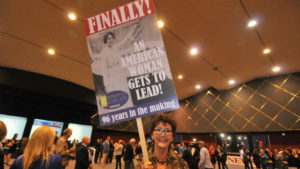 Laurie Black, a former member of the San Diego Unified Port Commission, said that when she was a student at San Diego State, with a minor in women’s studies, “I couldn’t have imagined that with all the history that I learned, we were actually someday going to have a woman at least as the nominee. Black, who is Jewish, added that her mother was a woman of the 1950s. “She left college, and got married, and in 1968 after reading Betty Friedan’s book [“The Feminine Mystique”] and Gloria Steinem, my mom went back to school, got her bachelor’s degree and master’s degree… Today, nobody would be laughing at my mother, nobody would be. She added that she has been troubled by the discourse in the presidential election. “I am pretty concerned about people going after judges,” she said — a reference to presumptive Republican presidential nominee Donald Trump attacking U.S. District Court Judge Gonzalo P. Curiel of San Diego as being unfair to him in the Trump University civil case, and unable to be objective because of his Mexican heritage and Trump’s widely publicized call for a wall to be built between the United States and Mexico. Larry Remer, a longtime political consultant who worked on the Proposition I campaign to boost the city’s minimum wage, suggested that Democratic candidates did well in this election because of the excitement over the Clinton-Sanders race, and because Republicans, either disheartened by Donald Trump or realizing that the GOP race already was settled, did not turn out in expected numbers. Either way, he said, there would have been a successful outcome for Proposition I, which will raise the minimum wage in San Diego to $10.50 an hour once the voting results are certified, and again to $11.50 an hour on January 1. “Our polling showed that even if there were not a Democratic surge or Republican vote suppression, it would have passed,” he said. 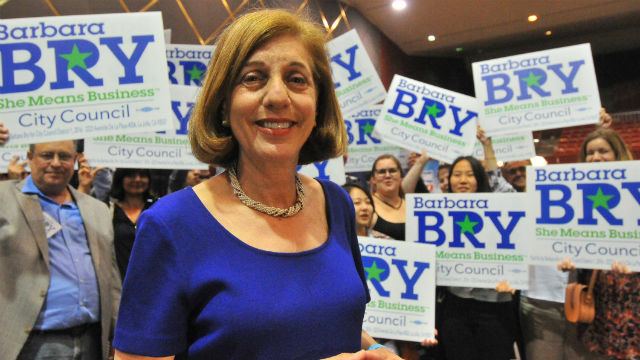 Remer said the combination of Democratic enthusiasm and low Republican turnout definitely helped Barbara Bry, a Democratic candidate for an open City Council seat against Republican Ray Ellis. The race featuring Bry, who is Jewish, was of special interest to retiring state Sen. Marty Block, who chairs the Legislative Jewish Caucus in Sacramento. Councilmen David Alvarez and Todd Gloria expressed similar sentiments. In Bry, he said, fellow Democrats would have an ally for progressive policies, such as increasing the minimum wage. Gloria, who meanwhile easily won the 78th District Assembly seat, said he wasn’t surprised that Bry topped the District 1 field, because he had been knocking on voters’ doors with her. “I am really impressed by the quality of candidate she is; she is working hard,” he said. Bry, interviewed by KGTV-Channel 10, credited her strong showing to “building a great team. I have been a high-tech entrepreneur and the founder of companies like ProFlowers and you can never do anything alone. And even though we were way outspent by Mr. Ellis and the special interests supporting him, we had hundreds of volunteers who knocked on doors. We had over 40 neighborhood coffees. Another San Diego City Council candidate who won outright in the primary was Chris Ward, who had been a member of Marty Block’s staff. 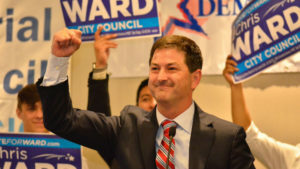 He defeated Anthony Bernal, a fellow Democrat, who had been a member of Gloria’s staff, to become councilman-elect in the 3rd District. Harrison is editor of San Diego Jewish World, where a version of this story first appeared.